Tamarack offers 45 kilometers of freshly groomed track that meanders around Twin Lakes and the Lakes Basin. On skis or snowshoes, Tamarack resort is a refreshing change for outdoor enthusiasts of all abilities. Tamarack's trail pass options make it easy to spend an afternoon in snowshoes or a whole day on skinny skis. When all the trails are operating, this is the best cross country skiing in Mammoth. If you never have tried cross country, Tamarack's ski school accommodates beginners to experts. Practice the classic stride, or learn more vigorous skate-style skiing. The ski center rents Nordic equipment, including striding and skating skis and snowshoes. 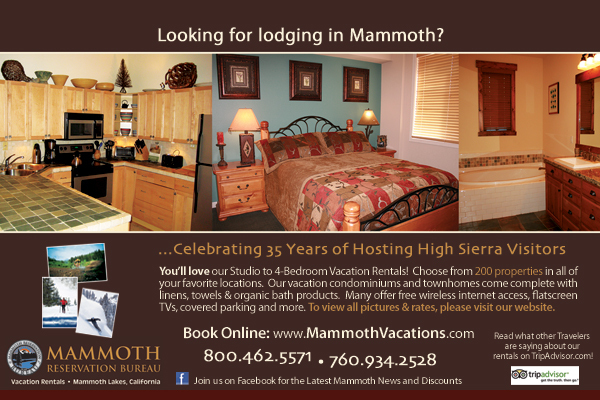 You can also stay at the famous Tamarack Lodge in Mammoth. Tamarack is open from 8am-5pm Weekends and Holidays and 8:30am-5pm Weekdays. They offer several different rate packages with afternoon beginning at 1:30pm and Twilight beginning at 3:00pm. Tamarack Cross Country operates from the first sufficient snowfall through Easter Sunday. Mammoth is known for its extensive trail system. The town has spent years and $$ naming and marking the trails that go surround the area. Some are flat, some are steep but all the cross country trails in Mammoth seem to loop around and come back to a trailhead or other starting point. You can get lots of information on the trail system at the Mammoth Welcome Center which is located as you come into town. All persons skiing or snowshoeing the trail system need a Trail Pass. Passes may be purchased directly at the ski center next to the lodge. The trail passes are less expensive when purchased ahead. Walkers, dogs, sledding and snowmobiles are not permitted on the groomed trails. Under the direction of Nancy Fiddler, Tamarack Cross Country offers the finest instruction in a wide variety of instructional and coaching formats for beginner to expert skiers. All lessons are subject to instructor availability. A and B level lessons are for beginner and novice skiers, and are available 7 days a week at 10am and 1:30pm. Enjoy an hour with one of Tamaracks professional ski instructors. Perfect your skills in a one-on-one learning environment in a special private lesson with Nancy Fiddler. All privates are by appointment only. TIP Tamarack also offers Naturalist Tours led by Forest Rangers. These interpretive tours explore the history of the Eastern Sierra and are free, but do require a trail pass, as they will access the trail system. They are fun and informative, and a nice way to break up your holiday. The tours look at the nature, flora and critters of the forest and are offered Friday through Sunday during the winter season, but check with the Lodge before venturing due to weather and availability.